I have a thing about squirrel hunting. It affects me in a way no other hunting does. I dearly love my duck hunting, chasing pheasants can be thrilling, and the pursuit of deer, elk and antelope is always an adventure. But I did not grow up in a marsh. Or on the Great Plains. Or high in the mountains, where elk roam. I grew up in the East, where the Great Forest once stretched for a thousand miles, from the Atlantic to the prairie. The old forest was where I came to know the outdoors, and it is where my heart remains. The woods were my home long before I picked up a gun. As a boy, I learned to walk quietly in them by setting one foot down slowly and then shifting my weight to that foot before I took another step. 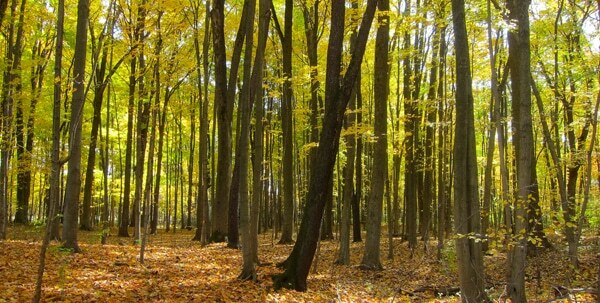 If I move slowly enough, I can remain silent even in a dry autumn forest. I used to do this to sneak up on my friends, or to get close to deer in the Watchung Mountains of New Jersey. Two decades later, it was in a Minnesota woods where I crept close to a gray squirrel before shooting it stone dead from the limb of a black walnut tree — my first kill as a hunter. Make no mistake: If you have not hunted squirrels in a real forest you do not understand squirrels. Country squirrels are as different from city squirrels as are Daniel Boone and Perez Hilton. The only things they share are genus and species. Country squirrels are animals all out of proportion to their size: They are clever, stealthy and tough to kill, especially when the leaves are still on the trees. Such it was when my friend Joe and I walked into the squirrel woods recently in Parkman, Ohio, not far from Cleveland. 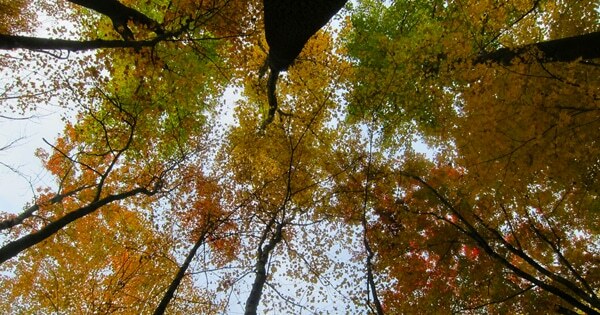 The fading leaves of autumn hide squirrels from danger, from hawks above and people below. All those leaves and twigs will deflect bullets just enough to turn a clean kill into a mess. So Joe and I armed ourselves with shotguns, Joe with his pretty little 28-gauge side-by-side, me with Tinkerbelle, my trusty 20-gauge over-under. We split up to cover different sections of the woods. It did not take long to figure out that there were squirrels around. 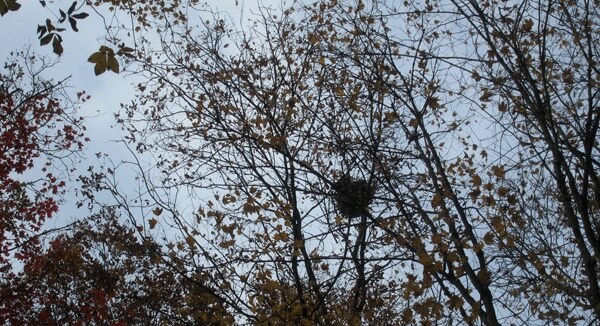 I hadn’t walked 100 yards before I saw a squirrel nest in the crotch of a tree. Then another. And another. I slowed down. Thankfully the woods were wet from several days’ worth of rain, which made it easier to move without sound. All around me were the sounds of woodpeckers ticking, the northern flicker’s hawklike screech, a multitude of tiny peeps and clicks from white sparrows and kinglets, the irked chirping of wrens. Occasionally crows cawed to each other, their topic of conversation unknown. Behind it all, I could hear the distinct chipping of squirrels. Leaning against a maple tree — this was a woodlot owned by a maple syrup-selling friend of Joe’s — I saw why this was such a good squirrel spot. Yes, squirrels do like the little helicopter seeds thrown by maples, but all around me stood soaring tulip poplars, with birch trees and sassafras beneath them, all ringed by oaks and beech trees. 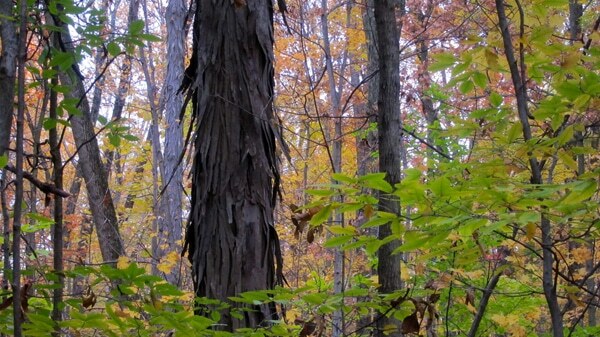 Dotted among these were mature shagbark hickory trees. Maple, oak, beech, hickory. A smorgasbord for nut-eating squirrels. A rustle. Close. In the fallen leaves. I swiveled my eyes right and saw a rusty gray shape on the forest floor, not 30 yards away. Squirrel! 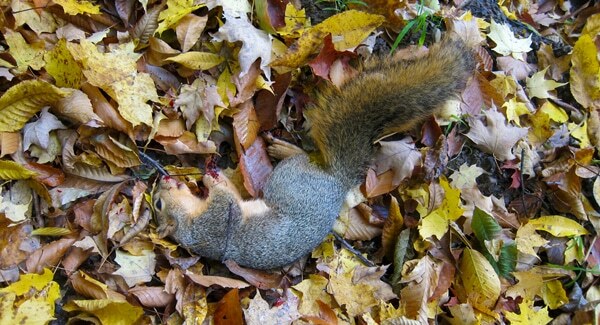 In a flash my shotgun barked and the first squirrel of the day fell dead. Squirrel hunting is all about noise. Whoever makes the most loses. This squirrel let me know where he was, and lost. It was the only unwary squirrel I met that day. If you are not familiar with squirrel species, this one is a fox squirrel. Larger than the typical Eastern gray squirrel, and not quite so smart, the fox squirrel is the second largest species I’ve encountered in North America; the largest is the very wary Western gray squirrel, which live here in California’s Sierrra Nevada. Joe said to look out not only for fox and gray squirrels, but also for an unusual subspecies of the gray squirrel that has black fur. I’d seen black squirrels before in Toronto and Washington DC, but had never shot one. I put the dead squirrel in my coat and moved on. Things would be different now. The forest knew I was here. I moved on quickly to another part of the woods, looking for more nests and larger, older trees. 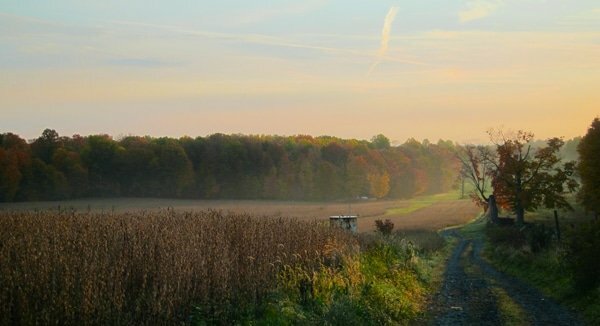 Hunting squirrels is very much like hunting deer: The hunt is a constant push-pull between the urge to stay quiet and hidden and the desire to cover ground, to see if the next stretch of woods is where you really ought to be. I’d never been to these woods before, so I moved as quietly and as quickly as I could to see what it had to offer. Soon I found a spot to make a stand. Several nests in sight, I sat down with my back to an old oak and kept my eye on a stand of hickory trees. After a few minutes, the forest forgot about me and went about its business. A few minutes more and I could hear rustling again, this time in the canopy. Another squirrel. I stayed as motionless as I could, moving my eyes to follow the squirrel as it wandered around the treetops above me. Slowly it descended enough for me to click the safety off my shotgun. It scampered down the trunk of a maple, in the open. I put the bead on its head and fired. The woods thundered as the shot echoed through it. The squirrel, far from falling dead on the leaves, looked merely alarmed and bolted back into the canopy. What the hell just happened? I stood up and paced out the distance to where the squirrel had been standing. It was more than 50 yards. Sigh. I probably annoyed that squirrel more than injured him. Squirrels, unlike rabbits and deer, have a thick hide. So thick that when Joe and I cleaned our catch at the end of the day, more than two dozen shotgun pellets clinked onto the table, falling harmlessly from the squirrels’ hides. Tough rodents. My spot blown, I walked on, looking for another. But I soon got into a younger stretch of woods, where I knew there wouldn’t be too many squirrels. I wandered around for another hour before deciding that my previous spot was in fact my best chance for another bushytail. I was right. I settled back under the old oak and waited. The morning began to warm, and I nodded off a little. A rustle. Then another. I opened my eyes, half expecting to see the squirrel eating acorns right in front of me. No such luck. He was up in the trees. This time he was a lot closer. I could see clearly it was another fox squirrel: large, with a ruddy chest. He was heading for the stand of hickory trees. I waited this time, waited until the squirrel silhouetted himself on the hickory’s trunk. This time when I shot the squirrel fell dead. 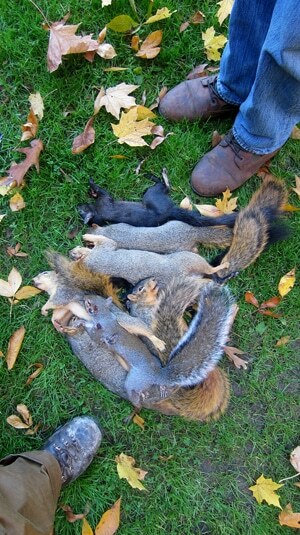 Finally I had a brace of squirrels, enough for Holly and I to have a squirrel dinner. I was happy with two squirrels, and happier that Joe had shot two himself, giving us four. But it had taken us hours to do that, and we were hungry. So we left, had lunch, and contemplated watching football for the rest of the day. As we cleaned our four squirrels, we reconsidered. “Maybe we should give it another go,” I said. After all, I don’t get to hunt squirrels very often. Joe agreed, and decided that we should go to another piece of land nearby with older trees. This turned out to be decisive. I shot the first squirrel as we were walking into the woods. “Hey Joe, do you see what I see? Is that a…” Just then it moved. Definitely a squirrel. At 15 yards, no less. Stupid mistake on his part. BANG! And just like that, I had my third squirrel of the day. Halfway to my limit. Once we got settled, the woods became a Shangri-la for us. Squirrels were everywhere. I’d never seen so many outside of a park; the carpet of acorns, hickory nuts and beech mast probably had something to do with it. An hour later, both Joe and I had our limit of six squirrels apiece. I’d managed to shoot all fox squirrels, but Joe had tagged a gray and a black squirrel. A bonanza! I was as happy as a kid on Christmas morning. I love eating squirrels every bit as much as I love hunting them, and Joe was nice enough to let me take home all twelve; after all, these woods were two minutes from his house. On the long drive home last week, my head swam with ideas about squirrel and dumplings, squirrel pot pie, braised squirrel. I also knew I’d finally be able to make a couple dishes I’d been thinking about for more than a year: A Hmong squirrel stew (the Hmong, a group of immigrants from Southeast Asia, love to hunt and eat squirrel), and a special, Russian-inspired dish I’ll tell you more about later. But most of all I was happy to be back in the woods again. My woods. As much as I love the High Sierra and the boreal forest of northern Minnesota — both are magical places — I feel like an outsider there, an adventurer from afar. Only in the East, where I know the names of every bird and plant, recognize intimately the sounds they make and the shapes they take, do I feel truly, deeply, at home. Great squirrel hunting story. I started hunting at a very young age and squirrels got me started. I love hunting squirrels and I think I will get to the woods and take advantage of the spring squirrel season here in Kentucky. I make a recipe you might like check it out. Great story. Not far from my house. I am heading out this weekend. Thanks.